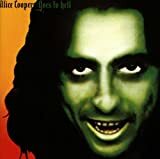 Alice Cooper's, "Go to Hell"
you even make your grandma sick! You'd even force feed a diabetic a candy cane! Alice Cooper's, "I Love The Dead"
Find me a funnier line in the history of rock and I'll eat Alice Cooper's top hat!! Alice Cooper's, "Prettiest Cop On The Block"
All this hair on my chest When the boys see me coming All the boys start to run They all got their empty holsters And I got the only gun Because.. This is possibly one of the funniest songs Alice ever did. It's a shame hardly anyone heard it. We can't even think of a word that rhymes!! Alice Cooper's, "You're A Movie"
I didn't know God went around doing pep talks.